“One of the primary indicators and fruits of faith is joy in midst of a confusing and broken world…. [Joy] arises from a life lived in wisdom, with a vision and passion for good work and with a resolve and capacity to love as we have been loved…. [Joy is] the fruit of or the evidence of our union with Christ” (p. 154). “What defines the church and the Christian, intellectually and emotionally, is the deep awareness that all will be well. This means we will get angry; we will fear and we will get discouraged. And we will mourn the deep losses of life. And yet sorrow is not our true home. We were designed to live in joy” (p. 157). “[Holy] people are happy people. They know how to dance….They are not happy all the time, of course. It is important to stress that holy people feel keenly the fragmentation of the world. They sorrow with those who sorrow; they know how to be angry without sinning. They know what it is to be profoundly discouraged without allowing their discouragement to go to seed so that they are nothing but cynics. They know the pain and sorrow of mourning; they have experienced loss and they have walked with others who have experienced loss. And yet what defines them is an emotional center, an emotional resilience, an emotional maturity that is perhaps most evident in deep and abiding joy” (p. 158). “The decision to sin always includes the thought that I cannot really trust God to watch out for my well-being” (p. 69). “There is nothing more winsome or attractive than a person who is secure enough in being loved by God that he or she lives with a spirit of openness and transparency and without guile” (p. 76). “Some people use their intelligence as a veil. Others use ignorance. Some veil themselves in busyness, in their work, in their vast competence and success….Ironically, many people in the church veil themselves in spirituality” (p. 79). “Acceptance is an act of the heart. To accept someone is to affirm to them that you think it’s a very good thing they are alive. We communicate this in a hundred ways, but the most powerful way is to listen with patience and compassion as they reveal their dark secrets” (p. 101). “[Generally] people who don’t read others well aren’t aware that they don’t” (p 108). “[There] is a direct correlation between the number of words you say and the number of sins you commit” (p. 111). “Every human being you know is making a request of their friends, though it often goes unspoken. Here is what they ask: ‘Motivate me. Call out the best in me. Believe in me. Encourage me when I’m tempted to quit. Speak truth to me and remind me of my deepest values. Help me achieve my greatest potential. Tell me again what God called me to be, what I might yet become” (p. 121). “To be alive means to be in conflict” (p. 131). “Avoidance kills community. Avoidance causes resentment to fester inside you” (p. 132). “Scott Peck says that most of the time we live in what he calls pseudocommunity. Its hallmark is the avoidance of conflict. In pseudocommunity we keep things safe; we speak in generalities, we say things that those around us will agree with. We tell little white lies to make sure no one’s feelings get hurt, no one gets tense. We keep relationships pleasant and well-oiled. Conversations are carefully filtered to make sure no one gets offended; if we feel hurt or irritated, we are careful to hide it. Pseudocommunity is agreeable and polite and gentle and stagnant — and ultimately fatal” (p. 180). Reconciling. Reconciling “requires the rebuilding of trust, and that means good faith on the part of both parties” (p. 158). “[When] we decide to stop trying to get even…. A new way of seeing and feeling…. [When] we discover the humanity of the one who hurt us…. [When] you find yourself wishing the other person well” (pp. 159, 160). “There are few joys in life like being wanted, chosen, embraced. There are few pains like being excluded, rejected, left out. At the core of Christian community is a choice, in the words of Miroslav Volf’s great book on the subject, between exclusion and embrace….It is part of our fallenness that makes us want to be in not just any group but an exclusive group….We exclude others because of pride or fear or ignorance or the desire to feel superior” (p. 186). “The desire to make it into the Inner Ring is by its nature insatiable. You will never succeed. However, when it comes to the choice to include people, you can hardly fail. They may refuse you, of course. But the mere effort will expand your heart and bring joy to God” (p. 192). “The ability to assign value is one of the rarest and most precious gifts in the world. People who live deeply in community learn to discern and express the value of other human beings. They are masters of expressing love in word and gesture. They assign high worth, value, and importance to others by viewing them as precious gifts…In a word, what they give is called honor” (p. 205). They are grateful for God and others. “God is not a solitary being; rather, the divine being is a union of three persons bound together by the mutuality of love. In like fashion we affirm and celebrate that the human person is not a spiritual monad but a being designed to live in interdependence and communion with others. Adam was created in the image of God to be in communion with God, but Adam was not created a solitary or isolated being. Genesis 1 celebrates the deep goodness of the created order, as is evident from the recurring line ‘and God saw that it was good.’ But then we have one of the most extraordinary declarations in all of Scripture when God says of Adam that it is not good for him to be alone” (pp. 128, 129). “The biblical vision is for the individual to thrive in community and in mutual interdependence….The deep challenge we all face…is that our hearts are bent on independence, self-sufficiency and autonomy. No one is naturally loving” (pp. 130, 132). “Humility is the antithesis of self-dependence” (p. 134). “Listening is the fundamental means by which we honor [each other] and fulfill the call to honor others above ourselves” (p. 139). “If we are marked by sincere or genuine love it is evident in this: that we listen more and talk less” (p. 140). “Hospitality also means that we do not impose ourselves upon [others] — we give them their space” (p. 140). “[We] cannot love until and unless we graciously come to terms with the imperfections and failures of others….This will include at the very least that we are patient with others, that we bear with and forgive each other” (p. 141). “Patience is closely linked to hospitality, only now our hospitality is that of those who accept rather than demand, whose hope and aspiration for the other are not oppressive but grace-filled. We let God do God’s work in the life of the other in God’s time” (p. 141). “Forbearance is the twin sister of patience….This mark of compassion and generosity signals not tolerance of evil or wrongdoing but the reality that all of us are on the road to transformation…” (p. 142). “To forgive means we let it go; we no longer hold it again [each other]. We bless [each other] rather curse the one who has wronged us” (p. 142). “[The] flipside of the call to patience, forbearance and forgiveness: the proactive resolution of wrongs” (p. 143). “Specifically, to serve the other is to respond to genuine, concrete need” (p. 144). “First, it is important to stress that our generosity is always a generosity ‘in Christ’…. Second, ‘in Christ’ also means that our acts are never to our own merit or honor; we can and must learn how to serve quietly without seeking recognition or thanks for the simple reason that we do it in Christ and for Christ…. Third, to love is to actively seek the welfare of [each other]. We are called to love; therefore our way of being in the world is always one of attentiveness for the well-being of all. And thus there is a close affinity between love and justice…. Fourth, one of the most powerful forms of service is intercessory prayer. We serve one another by praying for one another. It is done quietly and without fanfare; it is offered in secret as an act of service…” (pp. 145, 146). We have a need to connect. “The yearning to attach and connect, to love and be loved, is the fiercest longing of the soul. Our need for community with people and the God who made us is to the human spirit what food and air and water are to the human body” (p. 18). “Neil Plantinga notes that the Hebrew prophets had a word for just this kind of connectedness of all things: shalom — ‘the webbing together of God, humans, and all creation in justice, fulfillment, and delight'” (p. 19). “Community is the place God meets us” (p. 21). “Community is rooted in the being of God” (p. 34). “The Trinity exists as a kind of eternal dance of joyful love among Father, Son, and Spirit” (p. 35). “In the Bible, a person’s name generally stands for his or her character and identity. To gather in Jesus’ name means tro relate to other people with the same spirit of servanthood, submission, and delight that characterizes Jesus in the Trinity” (p. 40). What does that mean? Think abouwt the paralyzed man and the friends that brought him (dropped him through the roof) to Jesus (Mark 2:1-12). “Here is the truth about us: Everybody has a mat. Let the mat stand as a picture for human brokenness and imperfection. 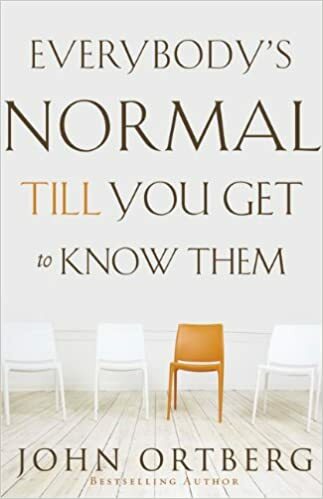 It is not what is ‘not normal’ about me. It is the little ‘as is’ tag that I most desire to hide. But it is only when we allow others to see our mat, when we give and receive help with each other, that healing becomes possible” (p. 47). “Humility and trust are more at the foundation of community than penrfection. If you want a deep friendship, you can’t always be the strong one. You will always have to let somebody else carry your mat” (p. 48). Family: “A group which possesses and implements an irrational commitment to the well-being of others…noticing and doing (p. 52). Friend: “When someone is your friend, your greatest desire for them — deeper than external well-being or even physical health — is that things are right between them and God” (p. 56). “Count on it: In community with Jesus and with those who love you, most of what happened to this man will happen with you: Sin will get named and dealt with. And although this sounds frightening, it may be the best gift of all” (p. 57). “The truth is, the more spiritually mature you grow, the more you will find your heart being drawn to people. You want to reach out to people, especially those neglected by society or far from God….People who don’t love people can’t love God” (p. 59). “This is vocational holiness — that on any given day or week or chapter of our lives, we are able to say, ‘I glorified God and completed the work that he gave me to do.’ To be able to say that for this day I have completed work God assigned to me” (p. 90). First, the language of vocation suggests that we live in response to a call…. Second, the language of vocation assumes that more is not necessarily better” (p. 90). The work of God in the world as Creator and Redeemer…. Ourselves as agents who respond to the invitation…. Our world — the actual situation of our lives, the arena into which God calls us…” (pp. 91, 92). “Our work is a participation in the work of God” (p. 92). “First, our work is a participation in the work of God….We create; we heal. In both cases, we are co-workers with God…. Second, when we speak of the work of God and thus our work, the sequence of creation and redemption are important….When we use the phrase ‘good work’ we must begin with creation: what did God intend when we were invited to be co-workers with the Creator?” (p. 93). “Vocation is discerned at the intersection of three realities. The first…is the vision of work in the Scriptures, specifically the work of God and his invitation to us to participate in that work. The second expression of self-knowledge is a gracious acceptance of one’s strengths and limits…. Perhaps what we should stress is that we need to identify and cultivate those strengths and capacities that open up the possibilities of fulfilling our deep passions. These are the strengths that matter…..
Limits are not a problem; they are an opportunity for us to focus, to truly embrace our calling. Furthermore, our limits bring us to interdependence with the strengths of others, allowing the synergy of our strengths to produce an outcome that is beyond — perhaps way beyond –both of our individual capacities…. The third critical reference in discerning vocation is found in careful attention to our circumstances. We are providentially located in time and space, thus ‘vocation’ is never just about us and God, about God’s mission in the world and our identity in response to that mission. It is also about the social circumstances and historical ‘accidents’ in which we have been placed….(pp. 97, 99, 100, 101, 102, 103, 104). “Vocation flows from union with Christ; it is an integral dimension of living in Christ, abiding in Christ and identifying with Christ. And our only hope for navigating the complex world of vocation, work, and career is to have a prior commitment to and practice of dynamic communion with Christ” (p. 122). “We are striving and running toward a goal — the telos of our Christian journey toward mature discipleship and transformation into sonship” (p. 44). “We are freed from sin, but to what end? Clearly, it is to enter into the power and presence of God” (p. 45). “In other words, our transformation is both an external transaction, by Christ and for us, and also a participation in the life of Christ Jesus through him as pioneer and perfecter of our faith” (p. 45). “And that is our goal: union with Christ. Our righteousness is not self-produced but arises from our union with Christ, and thus our only hope is to be participants in or partakers of the life of Christ” (p. 50). “What we are after here is a theology of Christian maturity — or, it could be phrased, a theology of Christian character” (p. 50). “Maturity in the Christian life is maturity in faith. Nothing so marks faith as this: that a person recognizes and lives in the reality that there is another order of life beyond what we engage with our five senses” (p. 53). “And so evangelism is about fostering and cultivating the opportunities for a person to meet Jesus: to meet Christ Jesus in real time. In the end it is all about Jesus. It is not about persuading [someone] of certain truths or laws, or even about believing that Jesus has done something — that if the “believe” it will lead to their “salvation.” It is rather about meeting Christ Jesus in person and in real time (p. 57). “[Attack and Withdraw] express the only two ways that many…people…see for dealing with each other….At root they are the two expressions of the one great sin, which is a lack of love, the violation of the one great commandment” (pp. 23, 24). “Our task is to create little islands of shalom in a sea of isolation” (p. 25). “In the Bible, a person’s name generally stands for his or her character and identity. To gather in Jesus’ name means to relate to other people with the same spirit of servanthood, submission, and delight that characterizes Jesus in the Trinity” (p. 40). How do we be in the Trinity at Trinity? How do we “meet Christ Jesus in person and in real time?” How do we “create little islands of shalom in a sea of isolation” and “engage in “fostering and cultivating the opportunities for a person to meet Jesus” to invite more to “gather in Jesus’ name?” How do we become a “holy people?” What does doing business have to do with that? Research from Gallup indicates that people who work according to their strengths are 6.0x more likely to be engaged in a career; and people engaged in a career are 4.6x more likely to experience well-being. Why Does Being Engaged In A Career Lead To Well-Being? God created us to work and manage his creation. Humans flourish when they have the opportunity to be engaged at work. They are engaged at work when they are empowered to discern, develop, and deploy their gifts and callings. Our big “C” calling is be holy. A contributor to becoming holy is using our gifts in ways that glorify God. A lot can be said here. But simply stated, we glorify God when we use our talents (Matthew 15:14-30) and walk humbly, love mercy, and seek justice (Micah 6:8). Our little “c” calling is to do that. What Leads To Being Engaged In A Career? In short, God created us to help others discern, develop, and deploy our gifts and calling. We believe organizations have a responsibility to create those experiences. This is what we seek to do at Trinity. How Do We Educate Students To Succeed? Critical thinking is the skill needed for all aspects of life. As M. Scott Peck says, “Life is a series of problems.” Best to be able to solve them. Personal Leadership means being able to manage oneself. Peter Drucker famously wrote: “Now most of us, even those of us with modest endowments, will have to learn to manage ourselves. We will have to learn to develop ourselves. We will have to place ourselves where we can make the greatest contribution” (Drucker, HBR Leadership Fundamentals, p. 7). Managing ourselves is a primal skill because at our core we default to being emotional, rationalizing beings. Today we refer to the skills that manage our primal instincts as emotional intelligence: “The key…to making primal leadership work to everyone’s advantage lies in the leadership competencies of emotional intelligence [EI]: how leaders handle themselves and their relationships” (Goleman, Primal Leadership, p. 6). For example, if you tracked high IQ people over time, who would rise to the top of organizations and stay there? You guessed it: emotionally intelligent people. Like Critical Thinking and Personal Leadership Development, Vocational Discernment is a necessary skill for success. Vocational Discernment, however, not only defines success differently, it empowers the development of Critical Thinking and Emotional Intelligence skills — more than any extrinsic motivator ever could. And it is not a gift to be achieved, but received. Note Vocational Discernment is different that Career Discernment. Although they could be the same, they don’t usually entirely overlap. One might say that one’s Vocation transcends and transforms one’s career, much like one’s eulogy virtues might transcend and transform one’s resume virtues (David Brooks). Some people find success by learning the rules of the game and using them to get ahead. Others break all the rules, or at least some of them. “I believe that God doesn’t want us to be satisfied with just the status quo. I think in a sense everyone is called to be an entrepreneur in a way. We are all called by God to approach life as an opportunity to use our skills that God has given us to better the world for the glory of God” (Jordan Rose). Another work for calling is vocation: “True vocation joins self and service, as Frederick Buechner asserts when he defines vocation as ‘the place where your deep gladness meets the world’s deep need’” (Parker Palmer). Interestingly, David Brooks tells us that we don’t find out calling, it finds us. That may be true. As Parker Palmer writes, “Today I understand vocation quite differently — not as a goal to be achieved but as a gift to be received” (Parker Palmer). In other words, it is a gift to be called to make the world a better place doing that which combines one’s deep gladness and the world’s deep need. The concept that pulls those concepts together, believe it or not, is Holiness. Can striving for holiness lead to joy? We are called to holiness (big “C” calling). In other words, God intends for us to be perfect. But perfection is not something we can obtain this side of heaven. However, in accepting it and then seeking it we can experience wisdom and joy! Joy and wisdom come from radical dependence on God and interdependence on others. Sounds crazy! We can strive toward holiness, believe it or not, by accepting we have a calling and seeking to discern, develop, and deploy it (little “c” calling). Doing so is incredibly empowering and motivates us to become even better at critical thinking and personal leadership. There is nothing more energizing than doing that which brings us fulfillment and joy. Discerning can occur when we listen to what God speaks in our lives and in our hearts — our holy discontent. Development can occur when our Adam II transcends Adam I (when our eulogy virtues begin transcending our resume virtues), and our “fundamental” state of leadership transcends our “normal one” such that it reflects the fruits of the Spirit. It is no long conforming to the pattern of the world (Romans 12:1,2). Deployment can occur when we actively pursue God and his will in our work. This is also the source of wisdom, which is both understanding and practice, “for we do not understand until and unless we live this understanding” (Gordon Smith). Therefore, if we wish to set students up for success, we need to enhance their critical thinking and personal leadership skills. But most of all, we need to help them accept and discern, develop, and deploy their gifts and calling. How do we do that? In the classroom but also outside of the classroom via experiential learning and mentoring. Which learning opportunities bring us joy? Why? Which meet the the world’s deep needs? How? Sometimes we forget to ask the big questions. “Jesus assures his followers that in him they will find life abundant, surely echoing this wonderful line from Psalm 1 that they will be like trees planted by streams of water. What are the contours and what is the character of this abundant life? What is the good life for which we were created and to which we were called? What are the indicators of a life well lived? To what end were we created? And thus, to what end have we been saved? (p. 14). 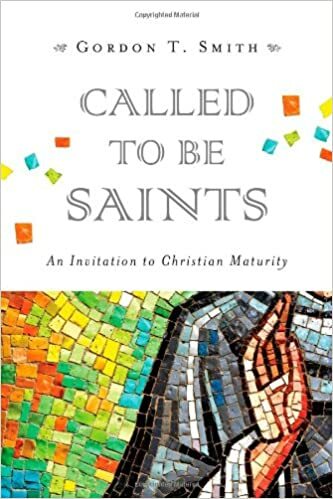 “[An] articulation of the call to spiritual maturity can and ideally should be inherent in each dimension of the church’s life and ministry…” (p. 17). “The Old Testament is essentially the account of a God who forms for himself a people who are specifically called to be holy” (p. 17). “Jesus uses language that makes some readers uncomfortable; he speaks of perfection (p. 18). “When we view the human vocation and sanctification from the vantage point of creation, we see the human vocation as fulfillment of creation. To be complete in Christ, to be ‘perfect,’ is quite simply to be what one was created to be” (p. 19). “The biblical vision is a life lived in radical dependence on God and in deep mutual interdependence with others” (p. 25). “Our theology of the Christian life must take account of how suffering…a means by which God forms and purifies us” (p. 31). “A holy person is a wise person. A holy person does good work. A holy person lives in a manner consistent with how God has loved us. A holy person is a happy person” (p. 36). “[The] Christian life is defined as knowing or gaining Christ, and this ‘knowledge’ is not a reference to intellectual understanding but to an experiential encounter with Christ. Paul used the language of to know in the same way it is used to refer to intimacy in marriage — we know Christ intimately” (p. 42). “[Our] transformation is both an external transaction, by Christ and for us, and also a participation in the life of Christ Jesus…” (p. 45). “And so evangelism is about fostering and cultivating the opportunities for a person to meet Jesus: to meet Christ Jesus in real time. in the end it is all about Jesus. It is not persuading [others] of certain truths or laws, or even about believif ng that Jesus has done something — that if they ‘believe’ it will lead to their ‘salvation.” It is rather about meeting Christ Jesus in person and in real time. Thus the church is nothing other than the place where there is a ‘Christological concentration:’ people who in worship and mission are about Jesus. That is their passion and focus and commitment. And as you join them in worship and in mission, in time you too will come to know this living Christ” (p. 57). Why are we here? What is the meaning of life? “[The] crux of the matter, the heart of the issue, is that Christian institutions — colleges and universities of higher learning — have the potential to offer transformative learning” (p. 219). “The greatest value that higher education offers the world — whether for the marketplace or the church — is wise men and women of mature character who are capable of providing vibrant moral leadership” (p. 220). “I propose that we can say to a prospective student, this is what we hope for you and long for you and offer to you. This is what we are about. This is what it means to be part of this academic community, this university, this seminary. You will grow in wisdom and in your capacity for wisdom. You will mature in your vocational identity and calling, and you will receive the inner tools and resources for a lifetime of vocational discernment. We will grow together in love and in our capacity for love, even as we are loved. You will become a happier person: you will know the joy of God, but more, you will grow in your capacity for joy” (p. 222).